Former Vice President, Joice Mujuru has given the biggest hint yet that she will seek revenge for the cruel death of her husband and decorated war hero Solomon Mujuru in 2011. Revered liberation war commander, Mujuru, died in a freak inferno at his Ruzambo Farm in Beatrice in August 2011. Now his widow Joice is pointing an accusing finger at President Robert Mugabe and his wife First Lady Grace and last week disclosed her wish for revenge, while addressing a round table meeting with women in business, during her ongoing London tour. “What killed Solomon is the reason why Mugabe and Grace have treated me the way they have been treating me like this, they know where it came,” Mujuru told her audience. One of her guests then interjected claiming she had evidence and knew how the late army general met his fate. Mujuru’s family have previously expressed their unhappiness over the findings of a government-sponsored inquest into the military supremo’s death. 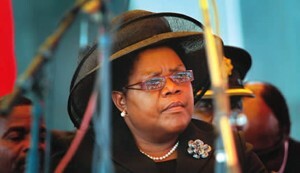 Mujuru told her guest to hold on to the evidence, indicating it might come in handy at some point in the future. “Thank you (lady with evidence) keep it, I will need it one day … because if they did not know what happened to my husband they would not have behaved like this,” Mujuru now opposition National People’s Party leader, said. First Lady Grace led the shrill campaign against Mujuru in 2014, accusing the then VP of a sinister plot to topple Mugabe. While Mujuru denied the charges that included dabbling in witchcraft, Mugabe bought into the accusations that bordered on treason and fired his deputy. However, no criminal charge has yet been preferred on Mujuru and her acolytes numbering almost 200, including former Cabinet ministers and no less than nine Zanu PF provincial chairpersons. Mujuru also told of her humiliation at the hands of Grace and her husband in her last days as the country’s number two and second-in-command of the ruling Zanu PF party. “I think you guys looked at me and wondered how a trained soldier, could allow herself to be humiliated by Grace (First Lady) in such fashion. It was like she was waving me around naked, forcing me up a tree and back, while my family including children and in-laws watched in horror. “If you know where I come from, I could have told Grace and her husband exactly what they deserved. They had skinned me alive, but I took a chill pill and said I am here to suffer for the women,” Mujuru said. The former VP said Mugabe was now having a “taste of his own medicine” as former Zanu PF youth leaders, who include Godfrey Tsenengamu and Acie Lumumba, have now joined the bandwagon of insulting the Zanu PF leader and his wife in public. “The way I used to respect Mugabe, but after he embarrassed me I gave everything to God. I left everything in God’s hands and said it is only him who would take away the respect I had for Mugabe. “Now where is he, he is being humiliated by young children, the same kids he trained to insult me are now haunting him and his wife,” she said. Lumumba called Mugabe by the F-word and awaits trial for insulting the 93-year-old strongman, while Tsenengamu is also on bail on the same charge including subversion after urging Mugabe to call Grace to order.